Your Schnauzer relies on you for his/her basic dog care needs. This includes: routine vet visits, dog grooming, dental care, daily exercise, proper nutrition, fresh water, obedience training, mental stimulation, toys, a comfy bed and spending quality time with your furry companion. By doing so, you know you’ve taken every step possible to ensure your Schnauzer's overall good health. Ahealthy dog is a happy dog. ​Miniature Schnauzers are a breed known for certain eye problems, Here is the link to the most common schnauzer eye diseases. Is your schnauzer itching and licking? Click here for some tips. Medical aid is something to consider getting for your schnauzers. After my first surprise hefty vet bill for my precious schnauzer puppy Max, I signed up for pet medical aid. I chose Medipet but there are also other options to consider. It gives me peace of mind. Do your own research and read up about what is covered and what is not covered before signing up. (Your vet should have brochures). Microchip your schnauzers so that they can be traced back to you! It is very important to ensure that your schnauzers are microchipped. The microchip is inserted under the skin and carries a unique code which identifies your pet. By entering the code into a computer database, your pet can be traced back to you. Regularly check that your microchip is working and that your contact details are up to date. Fireworks - tips to keep your schnauzers safe. Keep some lights on. Keeping a light on will calm your pet and make him feel more secure, rather than being scared in a dark room. Dampen the noise. Close the curtains in the room and, if your animal is a caged one, cover up the cage in a thick blanket, but make sure it is breathable so your animal doesn't suffocate. This will also help to stop the flashes of light affecting your pet. Plan to use familiar sounds to drown out the noise of the fireworks. Music from a stereo or turning on the TV are likely familiar sounds that can sooth your pet. Just make sure not to play these sounds ridiculously loud as they can become bothersome themselves. Prepare the room. 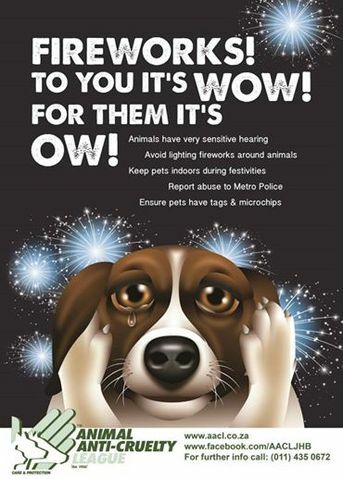 Select a suitable room where you will contain the pets for the duration of the fireworks. An inner room that is least impacted by the noise is ideal. It should be a room that you can close off to prevent your pet from running about the house and injuring itself, wrecking furniture, etc. If you have more than one pet, be sure they don't mind being confined in the same room, or select several rooms for different pets. For example, dogs and cats will usually appreciate being kept separate. Make the room cozy. Put down familiar, clean bedding somewhere pleasant such as under a table, on or behind a chair, etc. Add some familiar chew toys, scratch pads, balls, etc., to keep your pets amused and distracted. Be sure to leave sufficient water and food for your pet in the confinement space. Many pets will be uneasy, or even frantic. If your pet has access to water, it will help calm him, and food supplied in your pet's regular portion will make him feel like it's a normal day. Keep an eye on your pet, and if possible, stay with them. Comfort them and talk to her. Be friendly but don't fuss over them too much; this can increase their anxiety if they pick up on yours.